"You Are About To Be Spoon Fed Everything You Need to Know, To Start Easily Converting Every Visitor To Your Site Into Loyal Opt In Subscribers & Paying Customers Literally Overnight"
Would you like to finally have a steady stream of income that you can rely on coming in every Single month? Are you ready to have a massive list of opt in prospects that you can e-mail any time you want to earn instant profits? Would you like to have the power to turn on your own "cash on demand" ATM machine almost at will, anytime you want? You're going to learn how you can turn your website into a cash producing machine that you can simply turn on and count on for massive profits day after day, month after month and year after year by just following a few simple steps I am about to show you. I'm going to take you by the hand and prove to you that this system is not only different but that it actually works. Obviously you realize that you need to be able to take the traffic that comes to your site and turn it into subscribers, sales and lifetime profits. But have any of them actually paid off and delivered what they promised to teach you? Most of these courses that supposedly teach you how to turn your website visitors into customers are copywriting courses. 1) Most copywriting courses are thousands of pages long or contain 10 or more hours of video or audio that may take months for you to get through. 2) The only real way to become a good copywriter is to learn the basics and then write day in and day out to perfect the craft. Do either of those two things sound like something that you are going to want to do? The Top Secret Squeeze Page Discovery! Have you ever heard of a Squeeze Page? Well, I'll break it down for you so it's really easy for you to understand. A Squeeze Page is much like a lead generation page but it's much more tuned in to getting contact information from your website visitors. These innovative pages are extremely effective at grabbing the name and e-mail address of the visitors to your website and the great part is you don't need to be a copywriting genius! Get the name and e-mail address of your visitors so you can e-mail them as much as you want in the future allowing you to offer products and services for a profit. You Don't Need To Have A Lot Of Money Or Expensive Software To Create and Profit From A Squeeze Page! Up until now, it's always cost an arm and a leg to do anything regarding outsourcing design to your webpages. You've needed not only an HTML editor but you also needed a graphics program and loads of other tools and software to get your site pumped up for maximum sales. You don't need all of this expensive software and you don't need to go out and buy all of the latest and greatest website tools to make a Squeeze page effective. You'll also notice that you can actually make more money "without" a big, fancy sales letter by using these little Squeeze pages that work like crazy. NOTICE: Yes, this goes against everything that most of the "so called" online marketing gurus have told you in the past but it's absolutely true and if they were using this trick themselves, they'd realize it as well. A few are using Squeeze Pages and have been for years and the end result of that is a huge opt in list that makes them money hand over fist every month! What If I Am New To Internet Marketing And Don't Know Anything About HTML Or Designing Web Pages At All? This is probably something that you've been worrying about. I'm here to tell you that you don't need to know a lick of HTML to use Squeeze Pages to your financial advantage. The great thing about Squeeze Pages is they are very simplistic. You don't need to know HTML at all or any complicated software for that matter- Just open one of the templates we provide in a WYSIWYG editor and you will be good to go.. In fact, I know people who have used Microsoft Word to build a Squeeze Page! They are extremely easy to create and I assure you that if you can point and click than you can create a smoking hot Squeeze Page that turns visitors into subscribers. I'll even take it one step further and give you 35 proven Squeeze Page templates you can use however you like! Like A Boa Constrictor Snake Squeezes It's Prey! You see, people are getting accustomed to online sales letters and when they realize that they are on a page with a long sales message, many leave. Before a visitor ever sees your sales letter, they see your Squeeze Page and ONLY after they give you their contact information do they see your sales letter. This makes sure that even if they don't stick around to read the letter you can follow-up with them via e-mail and introduce them to your product or service a little bit at a time and link back to your sales letter. This gives you potentially hundreds of chances to make the sale with them. I'm sure that you are now starting to see the power and potential profit that you can grab using Squeeze Pages. Your Own Squeeze Pages Into Action! How To Stop Relying On Your Sales letter To Make Money! Secrets To Building A Profitable e-Mail List On Auto Pilot! Conversion Tips That Can Quadruple Sales Overnight! It's Never Been This Easy To Create Huge Profits With Your Website! A Comprehensive Guide To Squeeze Pages That Convert Is a new guide that will teach you the ropes of successful website conversion while helping you build a huge list at the same time! This information has never before been released to the public and is very confidential. This is the real deal, heavy weight information you don't see published to the masses. It's insider information that's currently being used to generate millions of dollars in sales and millions of subscribers almost effortlessly. If You Serious About Your Internet Marketing Business You Need To Ask Yourself If You Can Possibly Let This Incredible New List Building Machine Pass You By. Can You Honestly Live Without This Information? The Secret Statement That Will Make Visitors Feel All Warm & Fuzzy! How To Easily Get Your Visitors To Give You Their Main e-Mail Address With A Smile! Advanced Conversion Secrets You Can Put Into Place In Minutes! How To Build A Huge List To Follow-up With Completely Automatically! The 7 Components Of A Squeeze Page & How To Use Them! Secrets For Maximizing Conversion With A Minimum Investment Of Time! 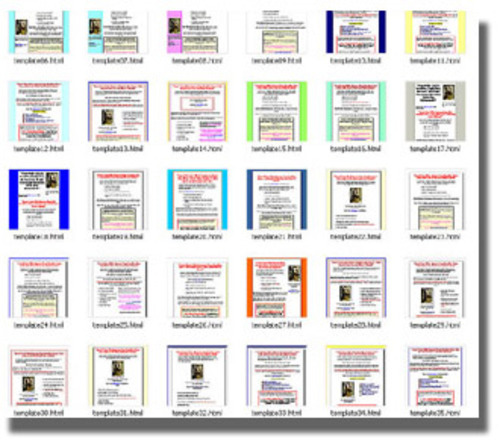 BIG BONUS - 35 Proven & Profitable Squeeze Page Templates For You To Steal!!! Isn't It Time That You Start Making Your Website Profitable While Building A Huge Mailing List At The Same Time? This Guide Is Going To Give You..
1. A Hyper-Responsive Website That Makes Sales Like Crazy! 2. A Mailing List That Makes Money On Demand With Just A Simple e-Mail! 3. More Subscribers, Customers & Bottom Line Profit Every Month! https://www.tradebit.com Power To Launch Profitable Sites At Will! While I did coach a few people at extremely high rates via the phone about using Squeeze Pages and did have plans to make this a high end audio course, I'm not going to do that. Instead, I've decided on a better solution for you. I realize that you may not have loads of money to spend on learning how to create effective Squeeze Pages. I also realize that you may have a website that just needs the edge that an effective Squeeze Page can give you to be profitable and I don't want to hold you back from having that. I took all the information that I shared with my coaching clients and I arranged it in a drop dead easy guide that you can read very quickly. You'll learn the 7 simple steps followed by case studies to reinforce the learning experience faster than you ever thought possible. And to top it off you'll be handed 35 hand selected, proven profitable Squeeze Page templates that you can use as your own. This will allow you to be up and running in no time! And since I don't have to do any phone coaching and am delivering this online as an instantly downloadable product, you get a huge price break. If you act today you get the entire Squeeze Page Guide, The Case Studies and The Proven Template Package for the ridiculously low price of just $3.95! Don't You Deserve A Profitable Website And A Huge Opt In List You Can Profit From Any Time You Want? Buy "A Comprehensive Guide To Squeeze Pages That Convert" Today and start your profit flood tomorrow! Look at it this way -- $3.95 is really a painless drop in the bucket to soon have the ability to replace your current slave wage income with an incredible Internet based income, one you grow on your own and one you can be proud of all the way to the bank! It's easy to get started right away. Just click the order link above. Click here to order right now for only $3.95 (even if it's 3:00 in the morning). P.S. Can you afford to spend 30 minutes a day on your financial freedom? Can you afford NOT to? Grab the book! You have nothing to lose and total financial freedom to gain! Don't waste another minute. Start your Internet empire and journey to total financial freedom right now!